It was raining outside the windows of the play room. A hard rain. The kind of hard rain the washes the scum up out of the gutters and . . .
A spread from an old project. 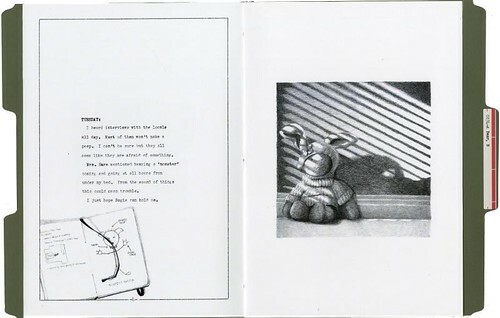 Our assignment was to create a book based on the 5 senses, so naturally I wrote a gritty film-noir detective's file about a missing teddy bear. Follow the image above for the whole set on my photostream. All the illustrations are in pencil, these were some of the first rendered pencil images, and all the body type I wrote out on an antique typewriter. This piece won a 2008 Kansas City AIGA Design Award.